Ever since the BIM wave struck the industry’s shores, there have been two intriguingly related discussions covering its drivers and its deliverables. The first discussion (or open question) is which industry stakeholder stands to benefit most from the wide deployment of object-based tools, procedures and protocols? Are facility owners the ones who will receive all the benefits? Or is it the contractors/builders who will be reaping most of the rewards? What about architects, engineers and other designers; aren’t they the ones to really benefit from BIM? The second discussion is which stakeholder is or should be leading  the industry-wide implementation drive? Should the architect lead by being the first to invest in relevant technologies and to develop collaboration workflows? Or, should the client drive construction innovation  through defined protocols or performance metrics? But isn’t it a fact that specialty sub-contractors (ducting specialists, steel detailers, etc…) were the first– for varied reasons – to jump onto the ‘elemental 3D’ train? The jury is still out on both questions and there are a lot of facts mixed with an equal measure of theories (including conspiracy-flavoured ones) floating around. This post is not about analysing ‘who should benefit’, ‘how should the benefits be distributed’ or ‘who should lead’ but it is more about a set of personal observations over a period of many years . The above image explores the relationship between two variables: industry BIM LEADERSHIP and expected BIM BENEFITS. Industry stakeholders are shown clustered around their respective Project Lifecycle Phase : Design [D], Construction [C] and Operation [O]. Until a more formal investigation is conducted to confirm (or refute) the above, it is intriguing to me how those who stand to benefit the most are not the same as those who are actually leading the pack. The benefits of using BIM concepts and technologies have been sufficiently documented by countless others; there’s no need to repeat them here. For a taste of these benefits, please check here. BIM leadership is a loose term describing actions taken (not words) including investment in BIM software, development of workflow protocols, engaging with others for the purposes of model-based collaboration, plus many other factors. Refer to Clients Driving Construction Innovation, a CRC-CI publication. For those concerned about context, the Visual Knowledge Model (VKM) provided above is based on informal yet informed ‘reflective learning’ (Derek, Svetlana, Janice, Frank, & Christophe, 2008) of the BIM domain within the Australian market from 2001-2010. The VKM may (or may not) be descriptive or predicative of other markets and durations. This VKM was first labelled BIM Innovation vs. BIM Benefits. Credit for some of the underlying concepts goes to Dr Guillermo Aranda-Mena (RMIT University) and from him to Jon Anderson (Hive Engineering). To understand Project Lifecycle Phases, please refer to BIM Episode 10. After introducing the basic differences between BIM Capability and BIM Maturity in Episode 11, and briefly discussing the many available and relevant maturity models in Episode 12, this post introduces a new specialized tool to measure BIM performance: the BIM Maturity Index (BIMMI). However, since BIM Capability Stages are established when minimum requirements are met; they cannot assess abilities (or lack of) beyond these minimum requirement. As a case in point, when using the Capability metric, two organizations using Tekla to primarily generate model-based steel details are said to be at BIM Stage 1. This is a useful bit of information because it sets these two organizations apart from all others still using CAD but tells us very little about their delivery speed, data richness or modelling quality. In fact, the two organizations may well be many experience-years apart without that being detected by the Capability scale. That’s why another metric (Maturity) is needed to assess and report on significant variations within service delivery and their underlying causes. The term ‘BIM Maturity’ refers to the quality, repeatability and degrees of excellence of BIM services. In other words, BIM Maturity is the more advanced ability to excel in performing a task or delivering a BIM service/ product. Without measuring these qualities, there is no way of differentiating between ‘real’ abilities to deliver BIM services form blatant BIM wash.
To address this issue, the BIM Maturity Index (BIMMI) has been developed by investigating and then integrating several maturity models from different industries. BIMMI is similar to many Capability Maturity Models (CMM) discussed in Episode 11 but reflects the specifics of BIM technologies, processes and policies. Maturity Level a (Initial or Ad-hoc): BIM implementation is characterized by the absence of an overall strategy and a significant shortage of defined processes and policies. BIM software tools are deployed in a non-systematic fashion and without adequate prior investigations and preparations. BIM adoption is partially achieved through the ‘heroic’ efforts of individual champions – a process that lacks the active and consistent support of middle and senior management. Collaboration capabilities (if achieved) are typically incompatible with those of project partners and occur with little or no pre-defined process guides, standards or interchange protocols. There is no formal resolution of stakeholders’ roles and responsibilities. Maturity Level b (Defined): BIM implementation is driven by senior managers’ overall vision. Most processes and policies are well documented, process innovations are recognized and business opportunities arising from BIM are identified but not yet exploited. BIM heroism starts to fade in importance as competency increases; staff productivity is still unpredictable. Basic BIM guidelines are available including training manuals, workflow guides and BIM delivery standards. Training requirements are well-defined and are typically provided only when needed. Collaboration with project partners shows signs of mutual trust/respect among project participants and follows predefined process guides, standards and interchange protocols. Responsibilities are distributed and risks are mitigated through contractual means. Maturity Level c (Managed): The vision to implement BIM is communicated and understood by most staff. BIM implementation strategy is coupled with detailed action plans and a monitoring regime. BIM is acknowledged as a series of technology, process and policy changes which need to be managed without hampering innovation. Business opportunities arising from BIM are acknowledged and used in marketing efforts. BIM roles are institutionalized and performance targets are achieved more consistently. Product/service specifications similar to AIA’s Model Progression Specifications or BIPS’ information levels are adopted. Modelling, 2D representation, quantification, specifications and analytical properties of 3D models are managed through detailed standards and quality plans. Collaboration responsibilities, risks and rewards are clear within temporary project alliances or longer-term partnerships. Maturity Level d (Integrated): BIM implementation, its requirements and process/ product innovation are integrated into organizational, strategic, managerial and communicative channels. Business opportunities arising from BIM are part of team, organization or project-team’s competitive advantage and are used to attract and keep clients. Software selection and deployment follows strategic objectives, not just operational requirements. Modelling deliverables are well synchronized across projects and tightly integrated with business processes. Knowledge is integrated into organizational systems; stored knowledge is made accessible and easily retrievable. BIM roles and competency targets are imbedded within the organization. Productivity is now consistent and predictable. BIM standards and performance benchmarks are incorporated into quality management and performance improvement systems. Collaboration includes downstream players and is characterized by the involvement of key participants during projects’ early lifecycle phases. Maturity Level e (Optimized): Organizational and project stakeholders have internalized the BIM vision and are actively achieving it. BIM implementation strategy and its effects on organizational models are continuously revisited and realigned with other strategies. If alterations to processes or policies are needed, they are proactively implemented. Innovative product/process solutions and business opportunities are sought-after and followed-through relentlessly. Selection/use of software tools is continuously revisited to enhance productivity and align with strategic objectives. Modelling deliverables are cyclically revised/ optimized to benefit from new software functionalities and available extensions. Optimization of integrated data, process and communication channels is relentless. Collaborative responsibilities, risks and rewards are continuously revisited and realigned. Contractual models are modified to achieve best practices and highest value for all stakeholders. Benchmarks are repetitively revisited to insure highest possible quality in processes, products and services. In a future post, I’ll shed more light on the detailed BIM Competencies that Capability and Maturity tools actually measure. For now, I’ll provide a sample BIM Performance Assessment summary generated using both metrics. Please note that - although the assessment below is based on my consultancy work - it has been significantly altered so that the ‘assessed’ organization cannot be identified. I’ve also removed most Performance Achievements (the useless positives), focused on Performance Challenges (the beneficial negatives) and added some explanatory notes [enclosed in brackets]. Technology: Usage of software applications is unmonitored and unregulated [different software tools are used although they generate very similar deliverables]. Software licence numbers are misaligned to staff requirements. 3D Models are mostly relied upon to only generate accurate 2D drawings [the data richness within the model is not being exploited]. Data usage and storage are not well defined. Hardware specifications are generally adequate but are non-uniform. Some computers fall well-below confirmed staff skills and their expected BIM deliverables [equipment replacement and upgrades are mostly treated as cost items - postponed whenever possible and committed-to only when unavoidable]. With respect to Networks, currently adopted solutions are not well integrated into the workflow [individuals and teams use whatever tools at hand to communicate and share files]. While there is an Intranet with a dedicated BIM section, the content is mostly static and not well suited to harvest, store and share knowledge [very few staff have administrative rights (or motivation) to upload information to the intranet]. Process: Senior leaders/managers have varied visions about BIM, and its implementation is conducted without a consistent overall strategy [as typical at this maturity level, BIM is treated as a technology stream with minimal consideration for its process and policy implications]. Change resistance is evident among staff [and possibly wide-spread amongst middle management]. The workplace environment is not recognized as a factor in increasing staff satisfaction/motivation [found to be not conducive to productivity – think of noise, glare and ergonomics]. While knowledge is recognized as an organizational asset, it is mainly shared between staff in an informal fashion [through oral tips, techniques and lessons learned]. Business opportunities arising from BIM are not well acknowledged. BIM objects [components, parts or families] are not consistently available in adequate numbers or quality. 3D model deliverables [as BIM products] suffer from too high, too low or inconsistent levels of detail. At the time of this assessment, it appears that more importance is given to [visual] quality of 2D representations than is given to 3D model accuracy [also, products and services offered by the organization represent a fraction of the capabilities inherent within the software tools employed]. There are no [overall] modelling quality checks or formal audit procedures. BIM Projects are conducted using undocumented and thus inconsistent practices [there are no project initiation or closure protocols]. Staff competency levels are unmonitored by [and thus unknown to] management, BIM roles need clarification [roles are currently ambiguous] and team structures pre-date BIM. Staff training is not well structured and workflows are not well understood [in one instance, staff were not systematically inducted into BIM processes; in another, were confused about workflows and ‘who to go to’ for technical and procedural assistance]. Performance is unpredictable [management cannot predict BIM project duration or HR costs] and productivity appears to still depend on champions’ efforts within teams. A mentality of ‘shortcuts’ [working around the system] has been detected. Performance may be inconsistent as it is neither monitored nor reported in any systematic fashion [as typical at this Maturity Level, the organization had islands of concentrated BIM productivity separated by seas of BIM idleness/confusion]. The above assessment summary may not provide a glossy image of an aspiring BIM-enabled organization. However, such a list of challenges – pointed and revealing as it is - will help the organization’s management to identify where it needs to invest time and energy to enhance its BIM performance. In summary, understanding Capability, Maturity and how to use both metrics to assess BIM Competencies can assist AECO stakeholders to determine their overall BIM performance levels. Once performance assessments are made, performance improvements will soon follow. Note that I opted to use the term BIM Maturity Index rather than Model to avoid confusion. Succar, B. (2009) Building Information Modelling Maturity Matrix. IN Underwood, J. & Isikdag, U. (Eds.) Handbook of Research on Building Information Modelling and Construction Informatics: Concepts and Technologies, Information Science Reference, IGI Publishing. Refer to the 4 levels in knowledge retention in Arif, M. et al. (2009), Measuring knowledge retention: a case study of a construction consultancy in the UAE. Engineering, Construction and Architectural Management, 16(1); pages 92-108. Nightingale, D.J. and J.H. Mize (2002), Development of a Lean Enterprise Transformation Maturity Model. Information Knowledge Systems Management, 3(1): p. 15. A definition of BIM Competencies has been provided in Episode 12 (endnote 2). You can also use the blog’s custom search engine to find it. After introducing the general differences between BIM Capability and BIM Maturity in Episode 11 , I’ll briefly discuss some of the currently available and applicable maturity models. The intention is to understand what other organisations and individuals have already achieved in this space and try to pin-point an appropriate performance-measurement model that can be adopted or modified to assess BIM competencies . Why is this important? If BIM implementations by teams and organizations are to achieve the much touted increase in productivity, these implementations need to be measured, compared against some sort of industry benchmarks and – most importantly – independently certified. Without measurement, organizations offering design, construction or operations’ services have no basis on which to improve their processes and deliverables. Without benchmarks and certificates, clients aiming to employ these organizations have no consistent way of understanding their BIM competencies. COBIT, Control Objects for Information and related Technology – Information Systems Audit and Control Association (ISACA) and the IT Governance Institute (ITGI) - weblink. CMMI, Capability Maturity Model Integration - Software Engineering Institute/ Carnegie Melon - weblink. 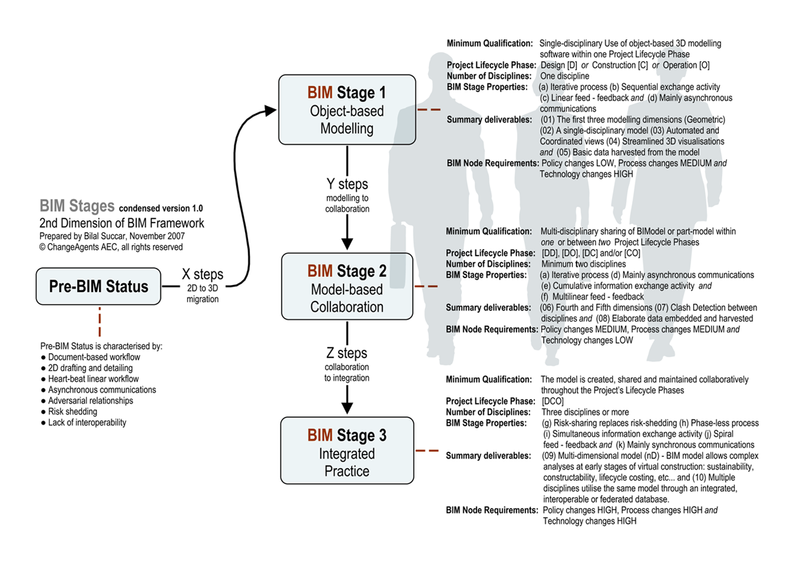 I-CMM, Interactive Capability Maturity Model developed as part of the National BIM Standard (NBIMS) Version 1 Part 1 - a project of the National Institute for Building Sciences (NIBS), buildingSMARTalliance™ - weblink. Let’s start with the definition: the U.S. National Building Information Model Standard™ (NBIMS) establishes “standard definitions for building information exchanges to support critical business contexts using standard semantics and ontologies...[to be]..implemented in software". NBIM Standard Version 1 – Part 1 proposes a Capability Maturity Model (CMM) for “users to evaluate their business practices along a continuum or spectrum of desired technical level functionality... [and to measure] the degree to which a building information model implements a mature BIM Standard”. There are two versions of NBIMS’ CMM. The first is a static table identifying 11 Areas of Interest (AOI) measured against 10 Levels of increasing maturity (Fig. 1). The second is the Interactive Capability Maturity Model (I-CMM), a multi-tab Microsoft Excel® workbook based on the static table and employing a point score against each AOI. The I-CMM tool has been designed to be used as an “internal tool...[to]...determine the level of maturity of an individual BIM project as measured against a set of weighted criteria agreed to be desirable in a Building Information Model”. I-CMM focuses primarily on measuring BIM information management and “should not be used as a benchmark for any other metrics”  including those related to architectural, engineering, construction and management. Also, I-CMM is not intended to be used as a “tool to compare BIMs or BIM implementations” . In addition to the above structural limitations, the I-CMM’s scoring system can theoretically generate different results (certificates) for the same BIM project if the tool is employed by different users or at different times. This is highlighted in how NBIMS ‘allows’ those who use the tool to modify AOI weighting according to their specific requirements (see page 79 of NBIMS v1, part 1). This variability in AOI’s weightings coupled with a ‘date-sensitive’ Minimum BIM score limit the tool’s reliability as well as its usability as an industry-wide, market-independent measurement tool. If one spends enough time and energy to analyse the many strength and shortfalls of available maturity models, s/he soon realizes what is missing: a specialized BIM Capability and Maturity tool that can be used internally by organisation and externally by independent assessors, can measure all key metrics related to BIM, has a consistent scoring system and is equally applicable across markets, disciplines and organisational sizes. Of course, it is not realistic to expect organizations to independently develop their own measurement tools and impose them on all others. It is also impractical to ask industry players to rely on tools developed by other industries and are unsuitable for measuring BIM. Finally, it is not useful to adopt existing tools that – although developed for BIM but - can neither measure all BIM indicators nor are consistent in their measurement. So what is the solution to all this? Can a maturity model and a measurement tool be developed to detect ‘BIM wash’, measure ‘BIMness’ and allow trustworthy certification of organizations which invest, develop and maintain their BIM competency? The term ‘model’ in this post denotes ‘knowledge models’ not ‘object-based models’ as typically associated with BIM. BIM Competencies are the generic abilities that teams and organizations need to acquire as they adopt and improve upon their BIM technologies, processes and policies. These competencies include technical (e.g. exchanging model data) and non-technical abilities (e.g. virtual team management) but all are important to move from Pre-BIM to IPD through a systematic and measurable approach. BIM Competencies are grouped in sets which are employed to establish either Capability or Maturity benchmarks. I’ll discuss BIM Competencies in a future post. Vaidyanathan, K., & Howell, G. (2007). Construction Supply Chain Maturity Model - Conceptual Framework, International Group For Lean Construction (IGLC-15). Michigan, USA. Arif, M., Egbu, C., Alom, O., & Khalfan, M. M. A. (2009). Measuring knowledge retention: a case study of a construction consultancy in the UAE. Engineering, Construction and Architectural Management, 16(1), 92-108. Kwak, Y. H., & Ibbs, W. C. (2002). Project Management Process Maturity (PM)2 Model. ASCE, Journal of Management in Engineering, 18(3), 150-155. Indiana University BIM Proficiency Matrix includes 8 categories measured against 4 maturity/proficiency levels. The matrix appears to focus on the accuracy and richness of the digital model (as an end-product) and has little focus on the process of creating that model. More information is available at http://bit.ly/iuBIM. Thank you to Dr. Umit Isikdag (University of Salford - UK) for bringing this effort to my attention. NIST. (2007). National Building Information Modeling Standard - Version 1.0 - Part 1: Overview, principles and Methodologies: National Institute of Building Sciences (Page 75). I will be reviewing the NBIMS CMM and I-CMM in more detail as part of my upcoming chapter ‘BIM Maturity Matrix’ in the Handbook of Research on Building Information Modeling and Construction Informatics: Concepts and Technologies (http://bit.ly/BIMhandbook). See AECbytes Viewpoint #33 (December 6, 2007), http://bit.ly/AECbytes1. Suermann, P. C., Issa, R. R. A., & McCuen, T. L. (2008). Validation of the U.S. National Building Information Modeling Standard Interactive Capability Maturity Model 12th International Conference on Computing In Civil and Building Engineering, October 16-18. Beijing, China. NIST. (2007). National Building Information Modeling Standard - Version 1.0 - Part 1: Overview, principles and Methodologies: National Institute of Building Sciences (Page 80). Construction projects pass through three major lifecycle phases: Design [D], Construction [C] and Operations [O]. These phases are also subdivided into sub-phases (Table 1) which are in turn further subdivided into activities, sub-activities and tasks. As an example of further subdivision, the Design phase [D] includes Architectural, Structural and Systems Design sub-phase [D1], which includes an Architectural Design activity [D1.1], which includes the Conceptualisation sub-activity [D1.1a] which lastly includes a 3D Modelling task [D1.1a.01]. The usefulness of these subdivisions will not be too evident in this blog post but just remember that BIM implementations can and will affect construction projects at Phase, Task and everything in between. For now we’ll just focus on the effects of BIM on Phases and I’ll discuss the effects of BIM on smaller lifecycle subdivisions in later posts. As a reminder, BIM implementation is initiated through the deployment of an ‘object-based 3D parametric software tool’ similar to ArchiCAD®, Revit®, Digital Project® and Tekla®. At Stage 1, users generate single-disciplinary models within either design [D], construction [C] or operation [O] – the three Project Lifecycle Phases. These models - like architectural design models [D] and duct fabrication models [C] - are primarily used to automate the generation and coordination of 2D documentation and 3D visualisations. Other deliverables of Stage 1 models include basic data exports (ex: door schedules, concrete quantities, FFE costs,...) and light-weight 3D models (ex: 3D DWF, 3D PDF, NWD, etc...) which have no modifiable parametric attributes. However, the ‘semantic’ nature of object-based models and their ‘hunger’ for early and detailed resolution of design and construction matters encourage ‘fast-tracking’ of Project Lifecycle Phases (Fig. 1). Figure 1 above depicts how object-based modelling encourages fast-tracking: when a project is still executed in a phased manner yet design and construction activities are overlapped to save time . That is, after achieving maturity within Stage 1 implementations, BIM players will acknowledge the benefits of engaging other design and construction players with similar modelling capabilities. Such acknowledgement and subsequent action will lead them to BIM Stage 2, model-based collaboration. Having developed single-disciplinary modelling expertise through Stage 1 implementations, Stage 2 players actively collaborate with other disciplinary players. This may occur in many technological ways according to each player’s selection of BIM software tools. Model-based collaboration can occur within one or between two Project Lifecycle Phases. Examples of this include the Design-Design interchange of architectural and structural models [DD], the Design-Construction interchange of structural and steel models [DC] and the Design-Operations interchange of architectural and facility maintenance models [DO]. Stage 2 maturity also alters the granularity of modelling performed at each lifecycle phase as higher-detail construction models move forward and replace (partially or fully) lower-detail design models (Fig. 2). Figure 2 above depicts how model-based collaboration is a factor in instigating fast-tracking and changing relative modelling intensity within each lifecycle phase. The overlap depicted is driven by construction players increasingly providing design-related services as part of their Stage 2 offerings and design players increasingly adding construction and procurement information into their design models. Also, changes in semantic richness across lifecycle phases occur as detailed construction and fabrication models (ex: steel detailing and duct fabrication models) partially replace the more generic upstream structural and mechanical design models. In this stage semantically-rich integrated models are created, shared and maintained collaboratively across Project Lifecycle Phases. This integration can be achieved through model server technologies (using proprietary, open or non-proprietary formats), single / integrated / distributed / federated databases [1,3] and/or SaaS (Software as a Service) solutions . From a process perspective, synchronous interchange of model and document-based data cause project lifecycle phases to overlap extensively forming a phase-less process (Fig.3). Figure 3 above depicts how network-based integration causes ‘concurrent construction’: a term used when “all project activities are integrated and all aspects of design, construction, and operation are concurrently planned to maximize the value of objective functions while optimising constructability, operability and safety” . In summary, object-based modelling will first blur the lines separating different project lifecycle phases. As model-based collaboration takes hold, lifecycle players start moving into each other’s territory. Finally, as network-based integration becomes the norm, design, construction and operations overlap extensively if not totally. A BIM data exchange is when a BIM player exports or imports data that is neither structured nor computable. A typical example of data exchange is the export of 2D CAD drawings out of 3D object-based models resulting in significant loss of geometric and semantic data. A BIM data interchange (or interoperable exchange) is when a BIM player exports and imports data that is structured and computable by another application. Interchanges assume ‘adequate interoperability’ between the sender and receiver systems. A. Jaafari, Concurrent Construction and Life Cycle Project Management, Journal of Construction Engineering and Management 123 (4) (1997) 427-436. Many industry discussions affectionately expand on BIM’s far-reaching deliverables: seamless collaboration, construction sequencing, shareable databases and fully integrated project delivery. While all these possibilities are foreseen today and are becoming more readily accessible as we speak (type), it is important to understand the deployment road ahead. Such an understanding will help us focus on the task at hand, better allocate available resources and prepare for the BIM-flavoured future. Note that each of these stages is further subdivided into sequential steps. What separates ‘stages’ from ‘steps’ is that BIM Stages are transformational or radical¹ changes while BIM Steps are incremental² ones within them. In this post, we’ll focus our attention on identifying the transformational stages within BIM Nodes. We’ll do that after briefly describing the Pre-BIM status which insistently prevails within the AEC industry. At the Policy front, the Pre-BIM status is characterised by adversarial relationships as contractual arrangements encourage risk shedding and over-the wall interactions. Moving to the Process front, there are huge dependencies on 2D documentation to describe 3D reality with all the problems this entails. Communication between different Players is less than adequate and project teams dismantle as projects reach a conclusion. Technology investment is low and data exchanges suffer from severe lack of interoperability³ between software applications...this surely cannot continue! After being wholly dependent on hand sketches, CAD and 3D visualisations, an increasing number of companies decide to cross the innovation chasm and invest in the object-based BIM applications (Figure 8.1). They quickly start to generate coordinated 2D documents and 3D visualisations from the BIM model but the parameter-rich model itself is not shared with other disciplines. Three-dimensional views and light-weight models (that may include object metadata but not active parameters - DWF, NWD, 3D PDF, KML files and the like) become the new phrases within a rejuvenated communication language. Through their adoption, these companies undergo ‘mild’ process change as they start generating a plethora of 3D views, quantities, specifications, what-if scenarios and other deliverables from the semantically-rich model. Since the BIM model is still single-disciplinary and the deliverables are mostly CAD-like documents, existing contractual relationships and liability issues persist....but not for long! Two disciplines, each ‘owning’ a semantically-rich model, decide to collaborate. They exchange and share models/databases which may not include geometry (think of Gantt charts, assets and environmental databases as examples of shareable databases). The two companies may jointly co-author a single database (example using ‘worksets’ in Autodesk® Revit®), link two different proprietary formats (example linking Digital Project® to a Primavera® database) or exchange non-proprietary files (example IFC, CIS2 or SDNF files). This ‘interopation’ allows them to perform 4D time-studies, interdisciplinary clash detection and generate an impressive array of analysis-driven deliverables. It is here where ‘traditional’ contractual relationships, risk models and ‘tried and tested processes’ start to show signs of significant strain and – with the absence of clear policy guidelines - nascent imaginative solutions. This fulfillment of this stage is the compilation of all construction-efficiency dreams and BIM philosophies. At this stage, project lifecycle phases dissolve substantially and players interact in real-time to generate real benefits from increasingly virtual workflows. At this Stage, existing and fast improving technologies play enabling roles and one set of technologies play a pivotal role: the increasingly available Model Server, replication or other model-federating solutions. These specialised network-based technologies store, share and control multidisciplinary input/output from participating stakeholders. It is here where current contractual policies and project processes lose their sync with technological possibilities. Of course and over time, processes evolve and policies get developed to enable the full potential of semantically-rich models and externally references databases...it may be a long road ahead of us. The interesting thing about all these Stages is that necessary technology infrastructure currently exists or is being developed. Whether we’re discussing software, hardware or networks, all are emerging and maturing quite rapidly. Processes (albeit experimental) are starting to follow as innovative companies increasingly ally together and push the frontier. However, the biggest absentee is still the many Policy players (refer to classification in Episode 7) who are slow to react and generate the necessary guidelines, regulations, liability protection and educational programs necessary for systematic progress. While Stage 1 only needs a BIM application and a champion and Stage 2 needs two players and the will to collaborate, Stage 3 needs much more than that. The Integrated Practice will need a systematic understanding followed by systematic consolidation of all relevant Technologies, Processes and Policies...It may be a long deployment road ahead of us but it’s surely a scenic drive! 1. Henderson, R. M. & Clark, K. B. (1990) Architectural Innovation: The Reconfiguration of Existing Product Technologies and the Failure of Established Firms. Administrative Science Quarterly, 35, 9. 2. Taylor, J. & Levitt, R. E. (2005) Inter-organizational Knowledge Flow and Innovation Diffusion in Project-based Industries. 38th International Conference on System Sciences. Hawaii, USA. 3. NIST (2004) Cost Analysis of Inadequate Interoperability in the U.S. Capital Facilities Industry. IN Gallaher, M. P. O. C., A. C.; Dettbarn, J. L., Jr.; Gilday, L. T. (Ed. ), National Institute of Standards and Technology. The confusion in BIM discussions and implementations can be dramatically reduced by systematically analysing the larger-than-life concept. We’ll do that by subdividing Building Information Modelling into its basic components and then relate them back to each other in a – hopefully – meaningful and useful way. As discussed in BIM Episode 6, there are three dimensions to every BIM discussion. The first dimension is what I term BIM Nodes – BIM circles if you wish – and it’s responsible for identifying industry’s stakeholders and their deliverables. The other two dimensions, BIM Stages and BIM Lenses, will be discussed in following posts. So what do these BIM Nodes (Update: now called BIM Fields) represent and why are they needed? · The BIM Policy circle includes all players responsible for generating standards, guidelines and contracts. These include AEC regulatory bodies, educational institutions and the like. · The BIM Process circle includes all players directly responsible for delivering buildings and other construction products: schools, bridges, shopping centres, etc...These include owners, designers, contractors and whoever is involved in a project’s lifecycle. · The BIM Technology group includes developers of tools necessary for the creation and management of building information models and other design-construction-operation technologies. These include software developers, equipment suppliers and product/service providers active within the AEC industry. Each circle includes a specific set of players who interact with each other and with players within other circles. As an example, Designers interact with Builders to generate Facilities– this is an internal interaction within the Process Node. Also Designers interact with Fire Authorities and other Regulatory Bodies to insure conformity with respective standards and codes – this is an external interaction between Process and Policy Nodes. Both types of interactions take the form of Push-Pull transfers between players (Figure 7.2). We’ll be discussing ‘product and knowledge transfers’ in other posts but for now consider AIs (Architect Instruction) and RFIs (Request For Information) as two examples of this push-pull behaviour. BIM Nodes and sub-nodes not only interact but they also overlap. Overlapping occurs when players or groups work (or need to work) together to form a joint industry body (think of RAIA, IAI and similar organisations) or generate a joint industry deliverable. As an example, Policy and Technology circles overlap when their players work together to generate interoperability standards (IFCs are a striking example). Also, all three nodes overlap (or need to overlap) to generate National or International BIM Guidelines. So really the importance of BIM Nodes – the first dimension of the BIM framework - lies in identifying interactions and overlaps between industry players. Once identified, it will be much easier to generate better modular manuals and more comprehensive BIM guidelines. Building information Modelling can be a very difficult topic to define. Just try to discuss it with a colleague and - more probably than not - you'll end up discussing endlessly overlapping topics. For example, you start to discuss BIM's effcts on industry and you end up comparing software solutions. Or, the topic starts with how to collaborate around the digital model and the discussion shifts to argueing risk-shedding vs. risk-sharing, insurance coverage and design fees. It doesn’t stop there, if you try to explain to how a small-sized company typically migrates from 2D to 3D or implements a basic BIM tool and the conversation shifts uncontrollably to model-servers and complex integrated practices. Just by reading the bolded text of the above few sources (out of hundreds of definitions and assertions out there) and BIM is a sounding more like a super TLA – a belated Three Letter Acronym that defines nothing in particular. One is left wondering if BIM is something you can buy off the shelf? Is it a change process or a construction procedure? Is BIM a GSA requirement, an NBIMS guideline or what exactly? If it is all of the above then isn’t it true that the breadth of a definition is inversely proportional to its usefulness? Faced with all this ‘BIM chatter’, AEC stakeholders will understandably find it difficult to pinpoint what they actually need to do to reap the promised benefits of BIM. The chatter causes the change process to sound more difficult, extended and complex than it should be...This need not be the case at all. To clarify the BIM topic, a ‘systematic analysis’ of the BIM domain will need to be performed. This should hopefully yield a clear, methodical and fuller description of what BIM is, is NOT as well as how to implement it in an incremental and sustained fashion. To systematically analyse then understand a loosely-defined concept like BIM, we first need to subdivide it into its components and analyse the relationship between them. The next few BIM episodes will do just that. Based on my ongoing research (academic and professional), I will attempt to simplify the discussion through ‘decomposing’ the BIM term into three complementary dimensions: BIM Nodes (players and deliverables), BIM Stages (evolutionary steps) and BIM Lenses (multidisciplinary analysis). I will later use these three dimensions to generate some BIM Steps – those elusive incremental steps needed to migrate from a 2D based workflow all the way towards an Integrated Practice. CWIC (2004) The Building Technology and Construction Industry Technology Roadmap. IN Dawson, A. (Ed.) Melbourne, Collaborative Working In Consortium. Hampson, K. & Brandon, P. (2004) Construction 2020: A Vision of Australia's Property and Construction Industry. Australia, CRC Construction Innovation. Penttilä, H. (2006) Describing The Changes In Architectural Information Technology To Understand Design Complexity And Free-Form Architectural Expression. ITcon, 11, 395-408.